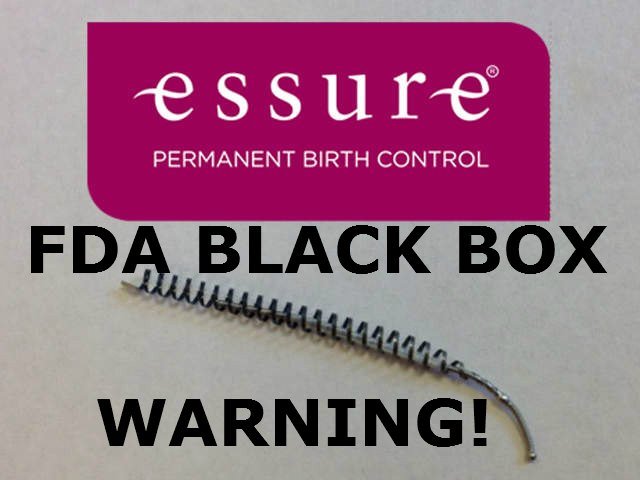 FDA Issues Black Box Warning for Bayer’s Essure Birth Control Device. February 29, 2016 – San Diego, CA The FDA has now completed its formal review of the Bayer Pharmaceuticals Essure birth control implant device and has now decided to issue a Black Box Warning for this product, also actions include a new mandatory clinical study for Essure to determine heightened risks for particular women and draft guidance with labeling recommendations and a checklist for doctors to discuss potential risks of implanted permanent birth control devices with patients. A FDA Black Box Warning is the strongest public warning level for any medical device or pharmaceutical medication and is the most stringent warning a medical device can carry before it is formally recalled. Here is the proposed Black Box Warning Label the FDA suggests for Bayer’s Essure Device. We believe that Bayer’s Essure device should be given this high level warning after a lengthy public review of the device, and countless women filling out the FDA’s Adverse Events Reports. We also applaud the efforts from Republican Congressman Mike Fitzpatrick of Pennsylvania’s eighth district introduced Essure’s “E-Free Act,” with a goal of protecting women from the dangerous birth control device. When Fitzpatrick learned of this issue with Essure, he took action. He got to work with his legislative aide, Justin Rusk, to draft the “E-Free Act.” Essure was the last straw in a series of clear safety failures at the FDA, which the Congressman has been tracking for years. Perhaps the strongest voices were the hundreds of thousands of women hurt from this device, many who contacted us in the last two years, we heard countess stories of pain and suffering from the Essure device. This could have been a major victory for these women, but the FDA has given Bayer more time to play with the data (cherry-pick) and still be able to sell this terrible birth control device. Essure Records Altered or Hidden. Back in October of last year, the FDA investigated allegations from several Essure women who say their reports of severe pain were buried by researchers studying the device in clinical trials. NBC New York was the first to report on Kim Hudak, a clinical trial patient from Ohio who claimed her answers were altered on some of the clinical trial surveys used to support Essure’s FDA approval. Hudak spoke at the September 24th FDA meeting and even supplied copies of her altered records. Essure Class Action Lawsuit Now Forming. If you or someone you know has had the Essure device and has suffered from any side effect or complications, we now urge you to act now and be a part of this historic medical lawsuit. There are two ways to become a plaintiff in this Essure lawsuit. Contact us directly toll free at 1-800-214-1010. Time is of the essence for the Essure class action lawsuit, and there may be statute of limitations that apply, so either call us TODAY or fill our the form at the link above.